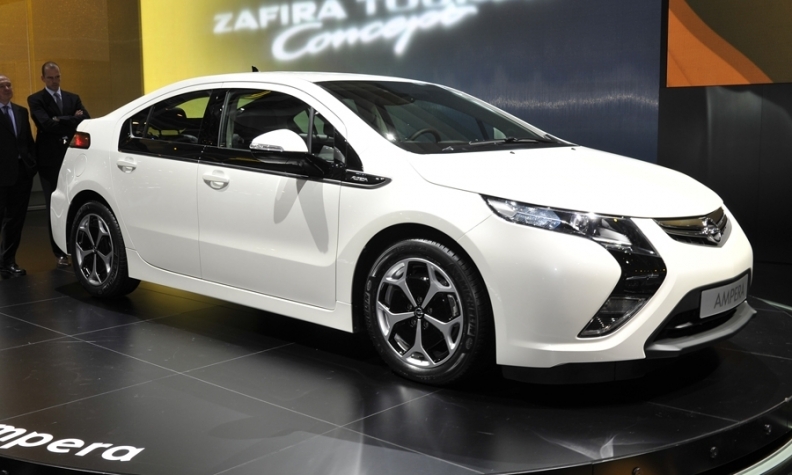 Opel/Vauxhall's Ampera hybrid will cost 42,900 euros when it goes on sale in November in Europe. FRANKFURT -- General Motors Co.'s European unit Opel/Vauxhall is considering taking on a partner in the field of fuel-saving hybrid powertrains in order to share development costs, as the brand rolls out more gasoline-electric cars. "Hybrid technology is becoming increasingly more important. We are not holding any concrete talks but a cooperation would be certainly a good way to cut costs," Opel CEO Karl-Friedrich Stracke was quoted by the Frankfurter Allgemeine Zeitung's Wednesday edition as saying. Stracke said a driving force behind the idea is European legislation that insists, by 2020, that carmakers must sell vehicles that emit an average of 95 grams of carbon dioxide per kilometer. "We need hybrid technology starting with compact cars and upwards," Stracke said. The automaker is betting the Ampera, an extended-range electric vehicle based on the Chevrolet Volt, will help. The car, which begin deliveries in November at a price tag of 42,900 euros before grants, has already received some 6,000 orders, the paper reported. In 2012, Opel/Vauxhall hopes to sell at least 10,000 Amperas across Europe. "Maybe we even hit 12,000 or more," Stracke said. Last month, Stracke told Automotive News Europe that any decision to build a second-generation Ampera would be based on the success of the hybrid's sales. The Ampera is currently built at the Hamtramk plant near Detroit in the United States.